I had NEVER kept a diary or journal of any kind! Too much I didn’t want people to know about me and no need for them to know it after I died. But back in 2003 I purchased elegant, leather bound books with lined paper inside–Costco style–a 3-pack. They were going to be Christmas gifts but I saved one for myself. I was in the midst of struggling with my beliefs and felt impressed to journal about it, to see where God took me. There are only 14 entries, the last was April 3, 2008. (You can see I’m not good at journaling) Yesterday I found it while looking for something else. I read the first post and thought of it this morning. It fits my illustration perfectly. (God’s timing) I am now going to share my first entry–and I’m not even dead–feel honored! A lot has happened between now and then but I believe God put those words in my heart to write and God led me to read them again yesterday. His way of reminding me of His presence in my life’s journey and His hand in opening and closing doors in fulfillment of my prayer to Him 12 years ago. A quick synopsis: I was able to quit my job to work as an artist in 2006 (faux finishing/muralist), last year I quite that business due to injury, burnout and feeling I’d tempted fate 20-feet up in the air long enough, I spent 2014 experimenting with, evaluating and writing about my art. Attempting to discover where my focus would be in fine art. In October I felt compelled to start ‘doodling’ my devotionals. Not for the purpose of sharing but for purely selfish reasons–learn how to loosen up and illustrate children’s poetry for my husband. Then I felt impressed to share them on Facebook, then a blog, and now, 133 doodles later, I believe this is a direct answer to the above journal post. Every day I pray that something I doodle or say brings light to someone and helps them on their own life journey. God places dreams in us and in turn He asks us to start stepping out in faith toward that dream–to move. 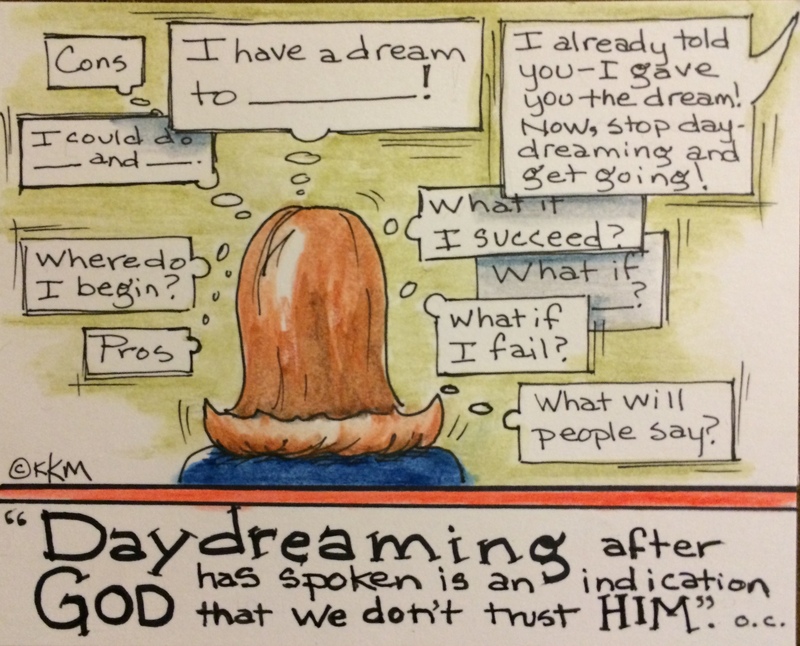 Yes, there have been many daydreaming days for me, much questioning and insecurities, then finally, I was reminded…”TAKE A STEP!” If God is in it and for me–what am I afraid of?! So today, I encourage you, take a step of faith and see where God takes you…trust Him with your dreams! Oh, and don’t forget to keep notes on the way–at least once a year or every other year. Then look at them once in a while, they will only reaffirm that God is in your steps.